I started to investigate how tactic cards really work. I said to post this separately, not only in the Bugs lists because I think this needs a discussion to understand how things are. a. 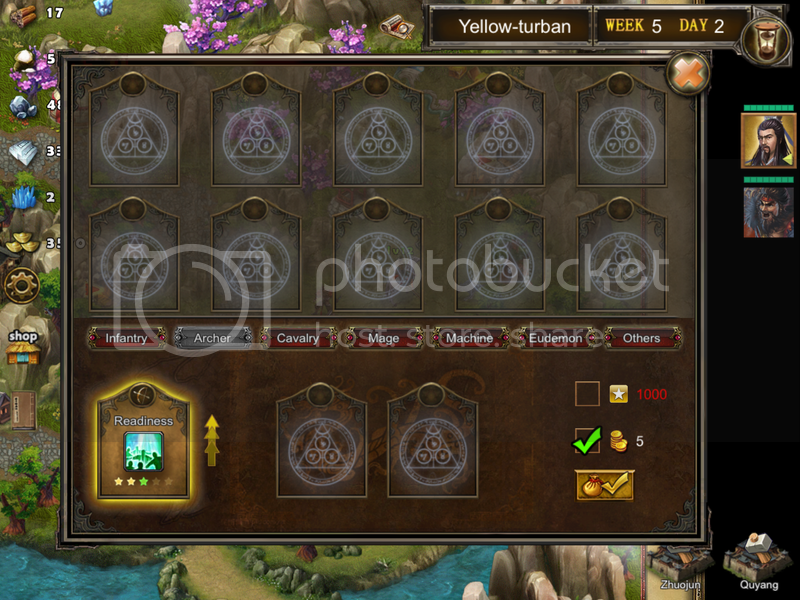 See the screenshot bellow - it says that you can choose only one, but actually you can choose 3 cards. And what set is it about? 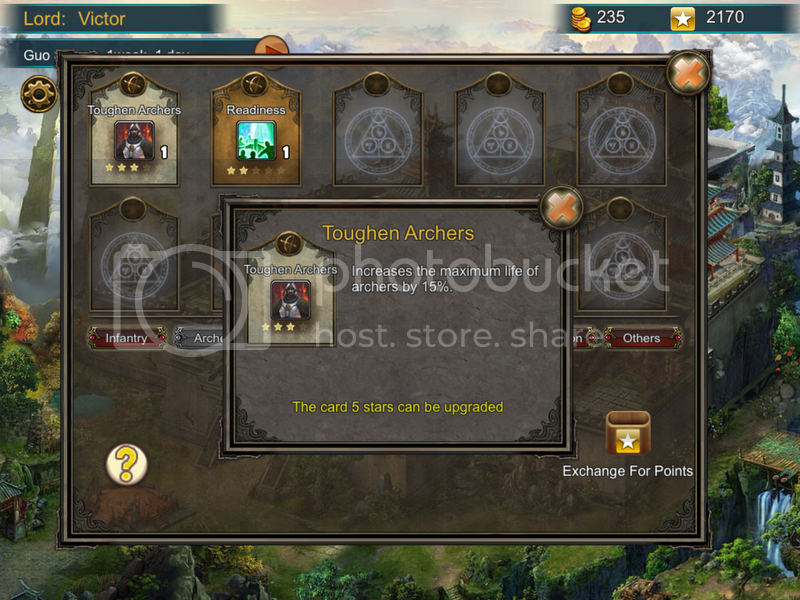 – I have 2 cards from same set (Archers) and I can use them. Either change the text or allow only one card. What is intended? b. Even if I have 5 gold for upgrading and the ok button is enabled, taping on it, won’t do anything. I tested that later with the 1000 exchange points and still the same. 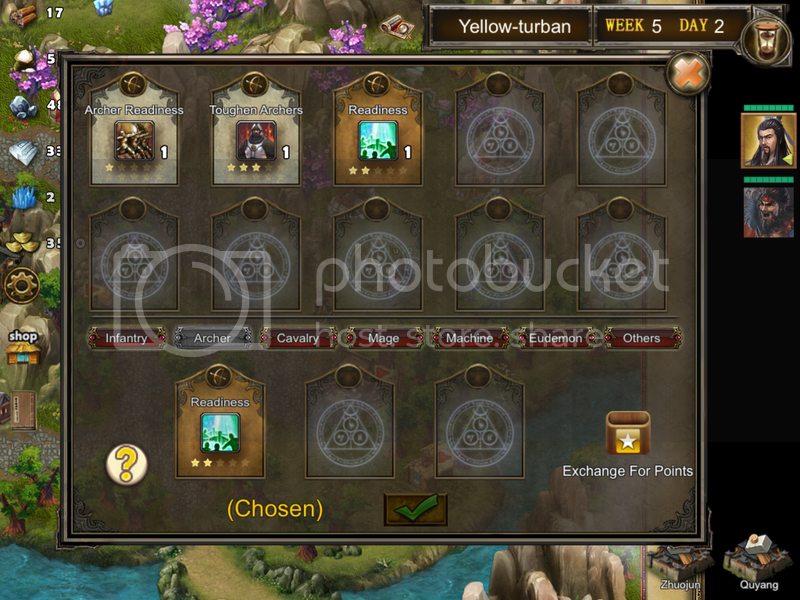 c. Also when selecting the Readiness card for upgrading the other cards will disappear from the upper rubric. Maybe this is if you want to use other cards to upgrade the one you have and maybe there aren’t ones that are ok, but this is not very intuitive and no explanations are given. - from Eudemons – Improve Freeze and Dragon’s Trace – both with 1 star from 5 and both they are saying “The card 2 stars can be upgraded” (see screenshot bellow). So I don’t understand this either – what 2 stars? Maybe somebody will explain more clear how the info on the screenshot bellow really works. For now I have a few hypotheses to answer my questions, but don’t know if they are right. 4. “The card 2 stars can be upgrade” – maybe what this is trying to say is that this card is not upgradable because it has only 1 star and there is a minim of 2 stars to be able to upgrade. I would change the English here to “Only minimum 5 stars cards can be upgraded” for the 10 ranks and “Only minimum 2 stars cards can be upgraded” for the 5 ranks and “Only minimum 1 star cards can be upgraded” for the 3 ranks ones. 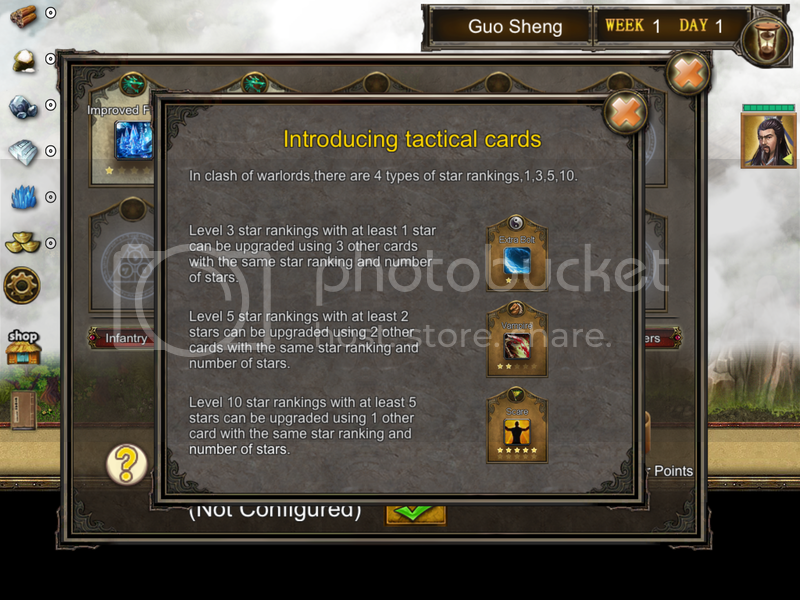 I have spent a lot of time and money to improve the level of tactic card and currently I think there is no bug based on my version. This post was not about bugs, but mainly about questions on how to use the tactic cards and how to upgrade them. Do you have an answer to that? Are my hypotheses from the end of the topic true? For your (a) situation you can use any three cards you want for the stage you play and you cannot change them until you finish the stage. You are right the text doesn't help to understand. 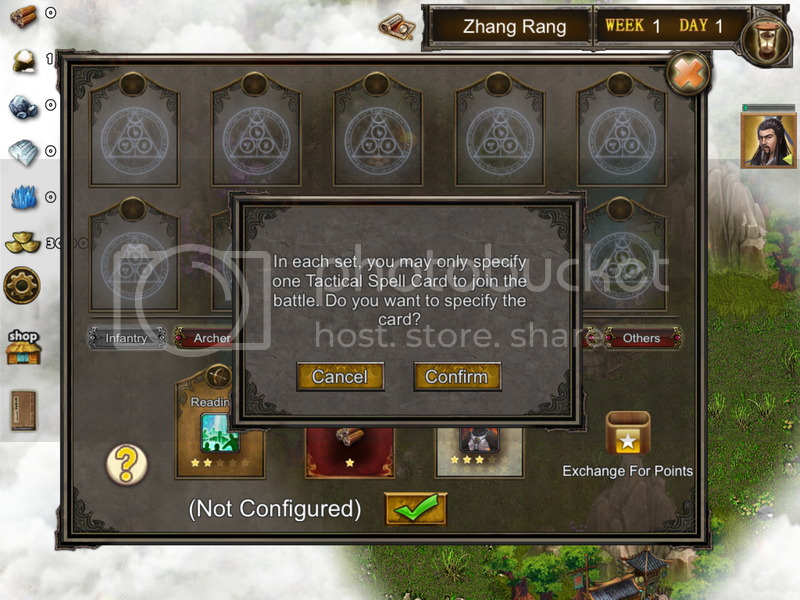 For your (b) situation you cannot upgrade the card because you haven't place 2 other cards in the slots right to the one that want to upgrade. You must place cards with the same number of stars with the one you want to upgrade. For your (c) situation that happens because you cannot use this cards for upgrade other cards. For your (d) situation mean that the selected card can be upgrade if it has five stars and not three. This cards are only good for exchange with points. So to upgrade one card must be first upgradable, second you have to sacrifice one or more other cards with the same stars and third spend the fee with gold or points. Last edited by MariosAdreas on Wed Jan 06, 2016 3:34 pm, edited 1 time in total. MariosAdreas wrote: Hi and Happy new year. For your (a) situation you can use any three cards you want for the stage you play and you I cannot change them. You are right the text doesn't help to understand.